Spring break is just around the corner for us and I’m creating a simple meal plan so that we can relax AND get things done. 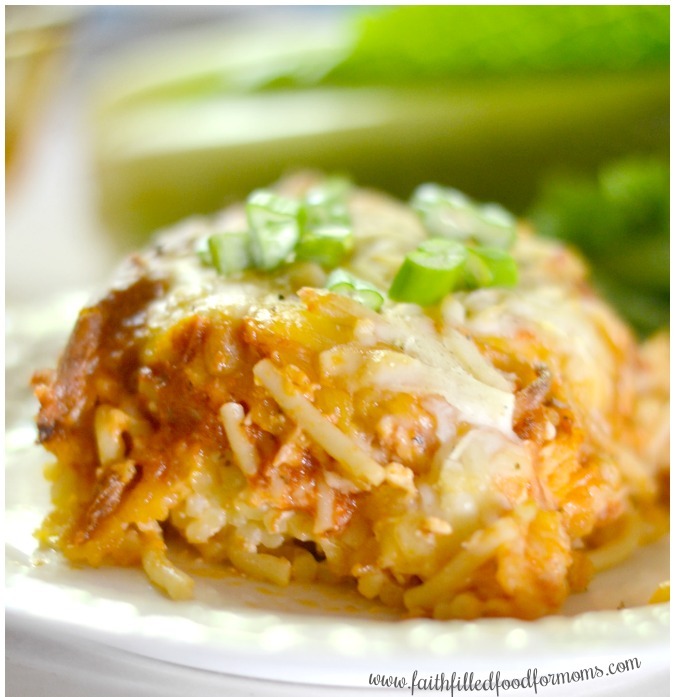 This Creamy Baked Million Dollar Chicken Spaghetti is so easy and delish! It’s a great addition to my Budget Friendly Meals! This great pasta recipe is loaded with Cream Cheese then baked in the oven so you can even make ahead. 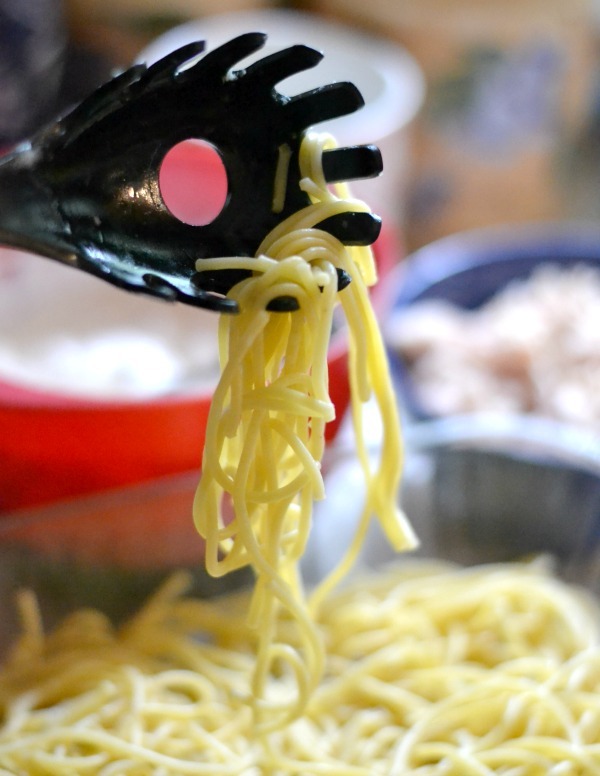 4 How do you know when pasta is al dente? 5 Can you Freeze Million Dollar Spaghetti? This isn’t your everyday run of the mill pasta dish! We add this to our meal plan rotation at least every other week. It’s made with ingredients we almost always have on hand. 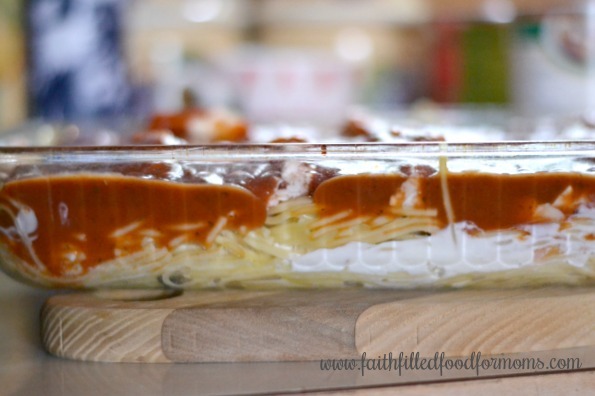 I’m so happy they love this simple Cheesy Baked Spaghetti Casserole! Boil your Spaghetti until it is Al Dente’. That means it is a little firm but cooked. Simply take a noodle out and eat it. Yep..that’s my scientific test. I don’t throw it against a wall or on the ceiling or anything else goofy. If the noodle is firm but done, I can tell by simply eating it…you will too. 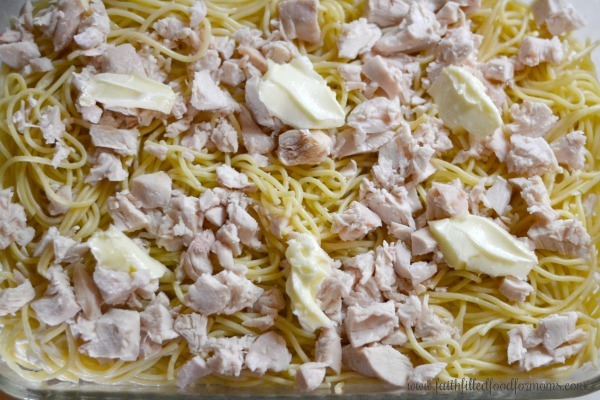 The reason we don’t cook the Spaghetti until its super done is because we are going to put the Million Dollar Chicken Spaghetti Casserole in the oven and it will cook a little more. Mix together Sour Cream, Cream Cheese, Cottage Cheese, Onion Powder and Garlic Powder. Chop up your Chicken if you have not already done this. 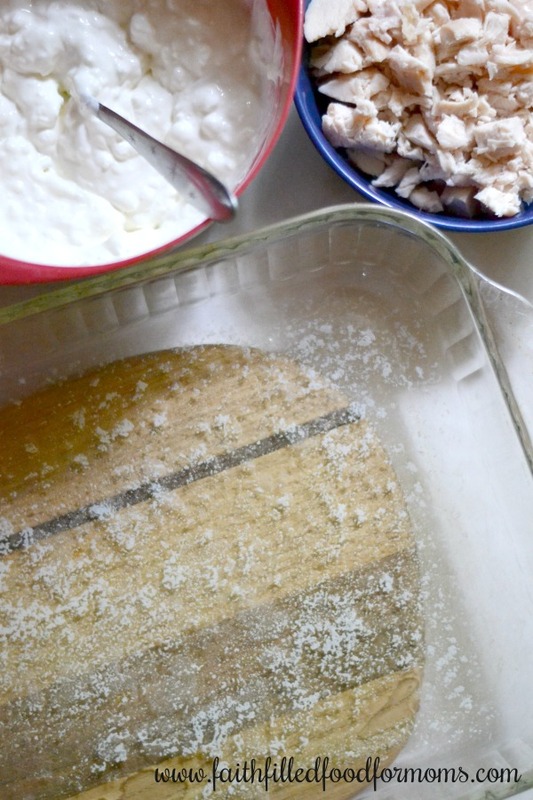 Add 2 Tablespoons to you 9×13 baking dish and put into the oven. Let the butter melt. Then remove. Pour HALF of the Spaghetti noodles into the casserole dish. 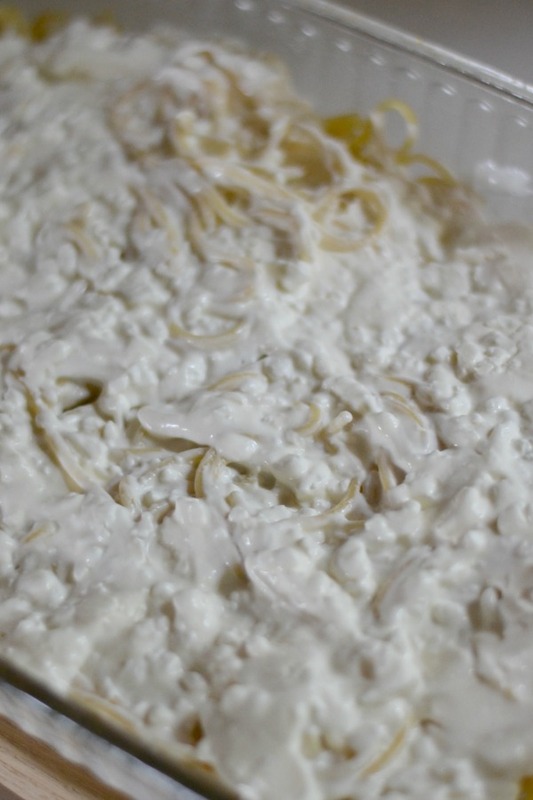 Top your Spaghetti noodles with the Cheesy Cream Sauce. Now add 4 1/2 cups of your favorite Spaghetti Sauce. You can use canned or Homemade Spaghetti Sauce. I usually use store bought sauce these days. The Spaghetti Sauces they make these days are just about as good as homemade in my opinion….just about. Top with the Cheddar Cheese. You can really use any kind of cheese you like. Mozzarella, Mexican Blend…anything! I happened to have Mexican Blend on hand when I made it this day. Can you Freeze Million Dollar Spaghetti? I’m adding this in right here because YES you can freeze it and NOW would be the time to freeze if that is what you want to do. 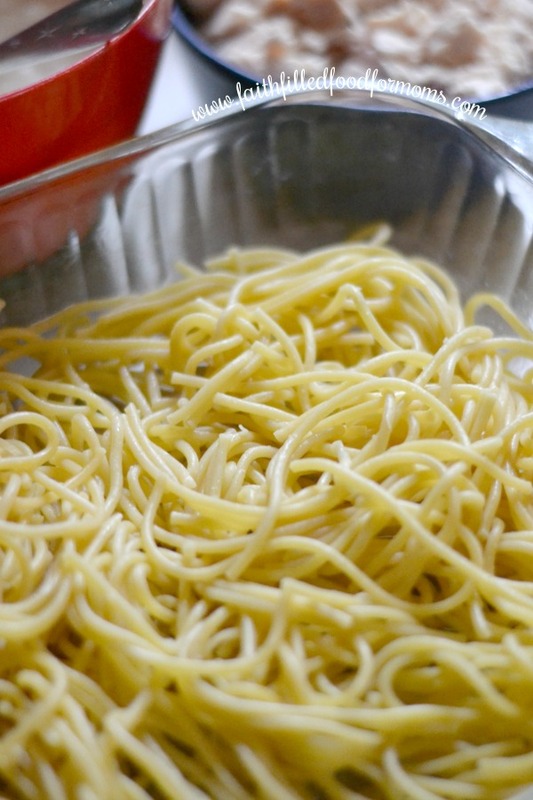 You can freeze cooked pasta! Simply cover the casserole dish with foil and freeze. On the day you are ready to cook, remove from the freezer, let thaw and cook 375 degrees 30 minutes. You can cook with foil on or off. Bake at 375 degrees for 25-30 min. Oh my! 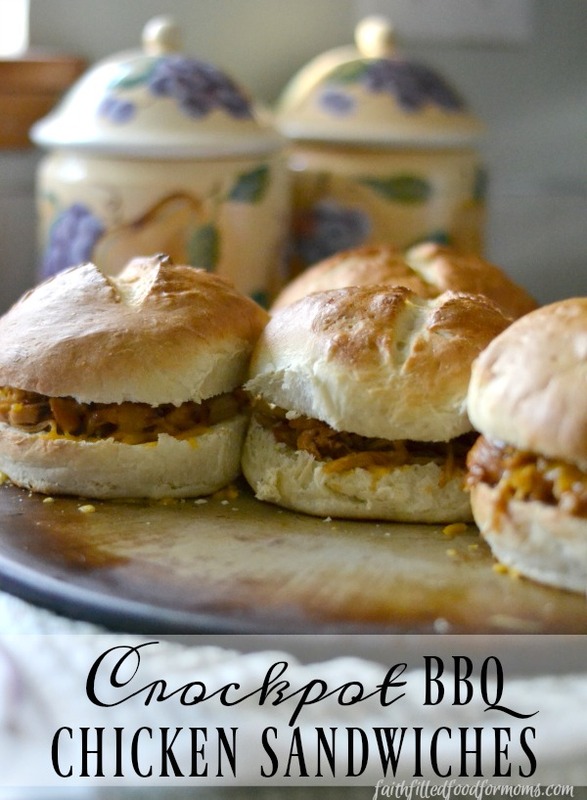 This is one of our faves for easy, cheap and quick and you’ll see why when you make it! Here’s my top tip for today for a make ahead freezer meal! 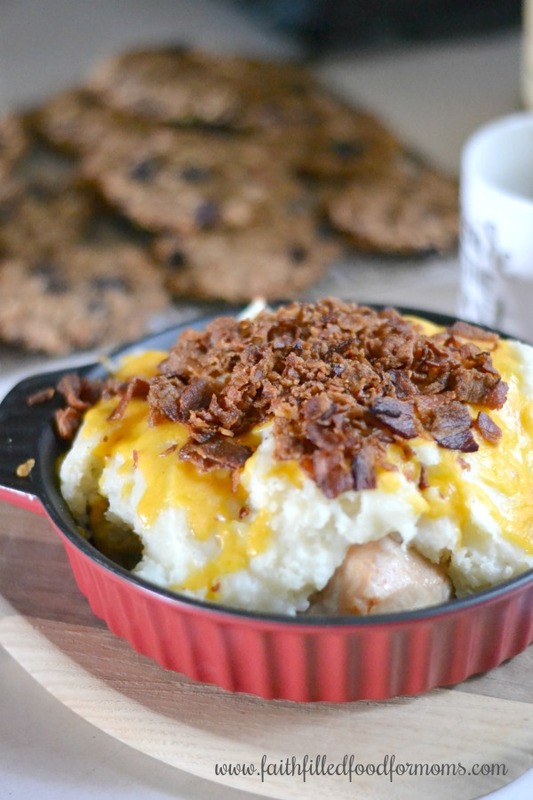 MAKE TWO Baked Chicken Casseroles! Double the recipe ingredients except when it comes to the sauces use Red Spaghetti Sauce for one casserole and Alfredo Sauce for the other! You can follow this recipe step by step simply freeze one! Then in a week or two…you have a whole new Million Dollar Chicken Alfredo Spaghetti Casserole and it will be a whole new meal! This Cheesy Creamy Baked Million Dollar Chicken Spaghetti will become a new favorite budget meal! It's delish! Can you freeze Million Dollar Spaghetti? YES! This was seriously good! I took your suggestion and doubled it, made two, and froze one for later. I love that you can even freeze this recipe. Thanks for such a delicious recipe! YUM! That’s so awesome that you are Mom to 7 also Sarah! My youngest is now 18! 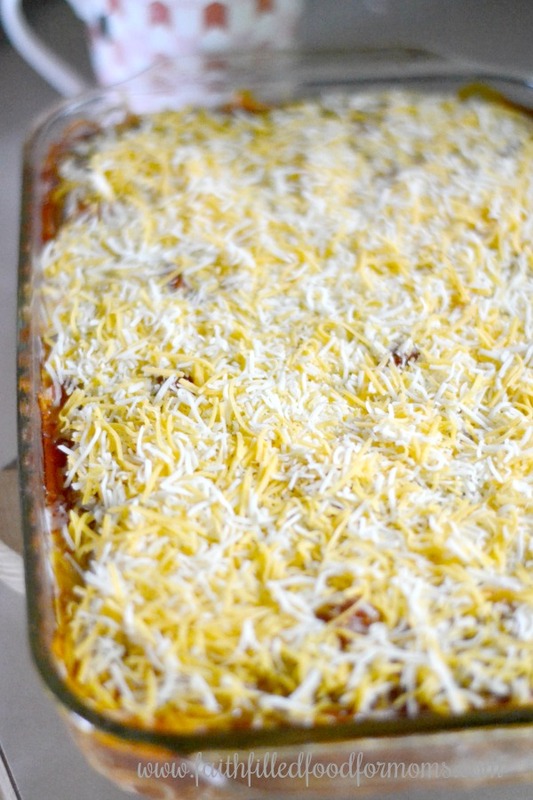 Making an extra casserole and freezing is such a super easy way to make ahead a meal! Blessings! This was creamy and delicious. I will definitely be making it again! Have you ever made it with a different type of pasta? Just curious. Hi Cynthia! Yes, you can totally use any kind of noodles/pasta you like! What a great idea to make two and save time for later. It’s my favorite way to add up my freezer meals. So easy! I didn’t have time to freeze it, it was brushed off in a flash! Thanks, great idea. That’s great to hear Fiorenza! Have a great day!